On October 26th I’m leading a ride from the Pueblo Day Use Area in Santa Teresa County Park. We roll at 8:30AM and there will be a BBQ at the Pueblo Day Use Area starting at around 3:30PM. We’ll be serving chicken, hamburgers, hot dogs, veggie burgers, all the typical condiments, a variety of salads, and desserts. There will be plenty of water, sodas, and a few beers. We’ll follow this RideWithGPS route and this Excel route sheet. There will be bailout points where two right turns and two left turns will get you back to the park if for some reason you can’t do the full route and make it to the BBQ in time. For a more formalized short route I’ve created a 60-mile RideWithGPS route with this 60-mile route sheet. Dan Connelly created a 60-mile southern route on RideWithGPS that Cara Coburn will be riding. You might want to join her if you’re doing the shorter version. This is a link to the south side 60-mile route sheet. I’ve created an Evite for people to sign up so I can get a count for the BBQ. If you didn’t receive the Evite please go to this link to sign up or send a note to me at lane.parker@outlook.com so I can add your name to the list. 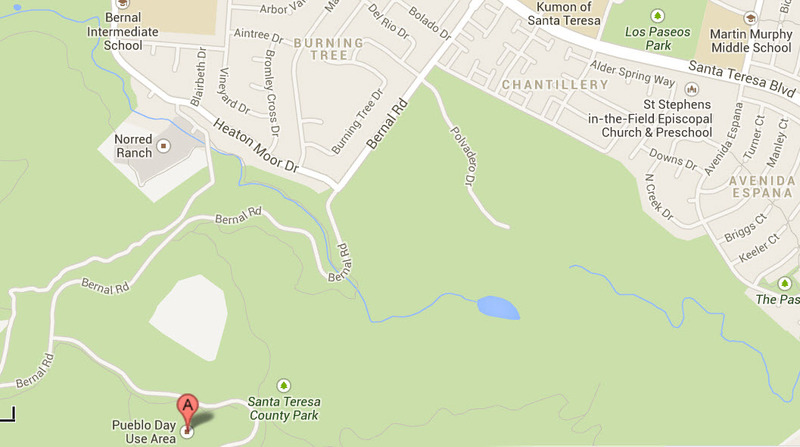 Directions to the Pueblo Day Use Area: from 101 in south San Jose take the Bernal Rd exit. Head west on Bernal for 2.8 miles then turn left on Drive to County Girls Ranch Rd and follow it for .3 miles to the ride start. Just bring your bikes and if you donate something to your favorite (or any) charity, leave a note regarding that if you want. Michele Rae and Dan Swinehart won’t be able to make it but she told me about a Parkinson’s fundraiser she donated to and Jim Fisk who will be there mentioned a donation to the Second Harvest Food Bank. Millie has hired a company to cater the BBQ since coordinating food from participants would be a royal pain. My son’s ex-girlfriend who just earned her degree in Hospitality Management is helping a lot as the event planner behind the scenes. It will be one of the first things on her resume following her graduation.